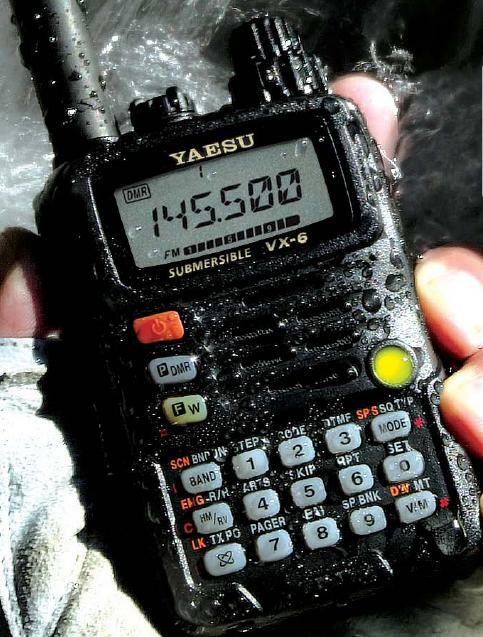 The VX-6R is a dual band heavy duty submersible (3 ft. for 30 minutes) transceiver with extensive receive frequency coverage, providing local-area two-way amateur communications along with unmatched monitoring capability. The VX-6R’s small size allows you to take it anywhere – hiking, skiing, or while walking around town – and its operating flexibility brings the user many avenues of operating enjoyment. Its incredibly compact FNB-80LI Rechargeable Lithium Ion Battery Pack provides up to 5 Watts of transmit power on 144 MHz and 430 MHz Amateur Bands. Besides 144- and 430-MHz transceive operation, the VX-6R provides receive coverage of the AM (MF) and FM broadcast bands, HF Shortwave Bands, VHF and UHF TV bands, the VHF AM aircraft band, and a wide range of commercial and public safety frequencies! Further more, the USA version enables 1.5 Watts of transmitted power on the 222 MHz Amateur Band. 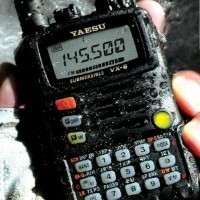 New and exciting features of the VX-6R are the Emergency Automatic ID (EAI) function, that will automatically cause your VX-6R to transmit your callsign and engage your rig’s microphone, even if you are disabled and unable to press the PTT switch; Enhanced Paging and Code Squelch (EPCS), that allows you to page a particular station and only receive calls from that station, if desired; and a security Password feature, that will allow you to turn on and operate your transceiver only after you enter your Password. Additional features include a convenient access key for Vertex Standard’s WIRES™ (Wide-coverage Internet Repeater Enhancement System), a transmit Time-Out Timer (TOT), Automatic Power-Off (APO), Automatic Repeater Shift (ARS), Yaesu’s exclusive ARTS™ (Auto-Range Transponder System) which “beeps” the user when you move out of communications range with another ARTS™ equipped station, plus provision for reduction of the TX deviation in areas of high channel congestion. And an RF squelch circuit allows the owner to set the squelch to open at a programmable setting of the S-Meter, thus reducing guesswork in setting the squelch threshold.